The original Slender was a freeware horror title released in the summer of 2012, featuring one of the internet's most infamous mythos - the tall, imposing Slender Man - as he chased players around an abandoned park. A reimaging of this proof of concept, Blue Isle Studios' Slender: the Arrival featured a much more robust story and an impressive visual overhaul, but most importantly, improved upon Slender's foreboding atmosphere, delivering a much more intense horror experience. From hunting down pages covered with mysterious messages in a darkened park, to frantically charging through an abandoned mining facility and scrambling to safety in a forest fire, Slender did an excellent job ensuring you rarely felt safe enough to stop and catch your breath. While a short game, Slender: the Arrival provided a solid horror experience that any fan of the genre can appreciate. A masterclass in building up dread before converting it into highly effective scares, Outlast is an atmospheric, demented, often disturbing first-person horror adventure. Set in the grisly Mount Massive Asylum, where maniacs run the show, players take on the role of a gullible and borderline-suicidal journalist, armed only with their wits and video camera. The video camera is a fantastic touch - holding it to one's face, it can be used to record and make observations about the world, as well as utilize a night-vision mode for navigating the asylum's darkest crevices in an eerie green hue. The result of this feature is a vibe not dissimilar to The Blair Witch Project and other "found footage" movies - a genre of horror with its share fair of critics, but just as many slavering fans. It's the little details that really make Outlast what it is. The environments are packed with incidental details, littered with non-hostile NPCs who perform all manner of unnerving activity. Subtle animations - such as the protagonist holding onto door frames as players move near them - craft an elegant, believable world. There are items and dialog that one could easily miss, but uncovering them are wholly rewarding. The bigger things, however, are just as appealing. 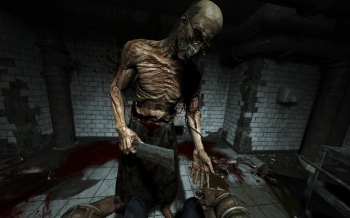 The game has a distinct Clock Tower influence, with characters like the insane Dr. Richard Trager chasing players relentlessly through the blood-soaked corridors. One of those games designed to constantly oppress, to turn players into frightened, hiding children, Outlast is a slickly designed horror game that, in spite of a few technical limitations, remains in the memory long after completion.